Anderson Cooper hosted a special 2 hour edition of AC360 on Tuesday night from CNN's Election Center in Atlanta. Flashback Tuesday: Anderson Cooper "I Like Poop!" COOPER: I'm happy to report that Miss Kentucky did not slip on the official duty that the penguin left on the floor thus successfully bringing to a close another great moment in "Ridiculist" history. It's been a while since the last episode of our Sunday Series. 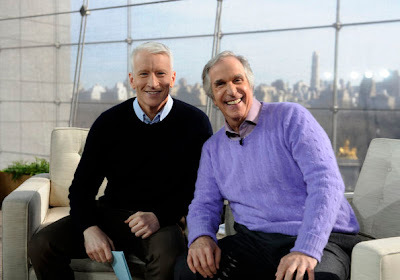 Things have settled down and we're ready to start back up with Anderson's Thursday December 3, 2009 appearance co-hosting Live with Regis and Kelly. The host chat included Anderson complaining about fans sending him emails, CNN Heroes, Susan Boyle, Facebook, man cleavage, Howie Mandel, Anderson losing his watch, Beyonce & Single Ladies and Anderson's aversion to dancing. ANDERSON discusses prenuptials and what couples need to know to protect themselves before getting married. Plus, consumer advocate Erin Brockovich and ANDERSON team up to help a distraught viewer whose house was destroyed by a negligent company that refuses to take responsibility. Families in Crisis and Is Your House Making You Fat? ANDERSON looks at how unemployment is affecting families across the United States. ANDERSON also speaks with a nutritionist who reveals simple changes that people can make around their home to help them lose weight. Hollywood superstar Katherine Heigl (One for the Money) joins ANDERSON, and speaks intimately about family, loss and whether she regrets being so outspoken about the people she’s worked with. Plus, for the first time since the accident, the survivors of the tragic Honduras plane crash are reunited with the rescuers who saved their lives. Music’s living legend Madonna joins ANDERSON for a special daytime exclusive, just days before performing at SUPER BOWL XLVI. Madonna speaks candidly about dating, raising children and her new film W.E., which she co-wrote and directed. ANDERSON is joined by writer, director and actress extraordinaire Drew Barrymore, who dishes on everything from her recent engagement to Will Kopelman, to her new movie Big Miracle. RoseMarie Terenzio, who served as assistant to JFK Jr. for the last five years of his life, also joins ANDERSON and reveals the details of JFK Jr. and Carolyn Bassette’s final days. 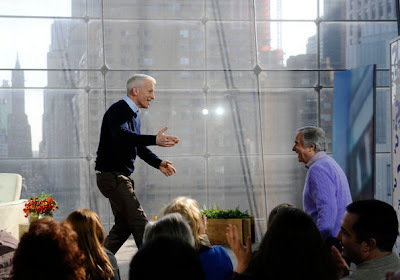 It was announced on February 23rd last year that Good Morning America's Senior Executive Producer, Jim Murphy, was leaving ABC to become one of four Executive Producers for Anderson Cooper's daytime talk show. 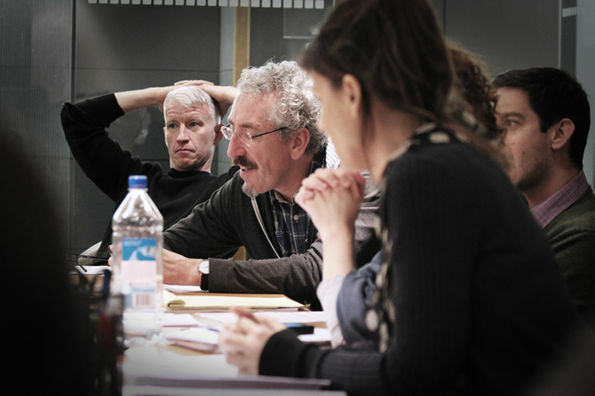 Today Deadline Hollywood broke the news that Murphy would be parting company with ANDERSON leaving only Cooper and the new-to- the-show Terence Noonan to EP the program. Noonan, a four-time Daytime Emmy winner, and co-author of Starring You!, has a background producing TLC programming and also spent time a producer on The Dr. Oz Show. Guests: *Andy Cohen, Host of Bravo TV's "Watch What Happens Live"
What Did We Learn On 'Anderson' This Week? If you actually watch 'Anderson' you occasionally learn a tidbit about the host himself. This week we picked up on two things. SPOILER ALERT on today's mystery guest! Anderson was so excited by his mystery guest — Henry Winkler — he got up on his set’s coffee table and knocked it over. (via TVNewser.com) Not sure if this makes it to air or not! 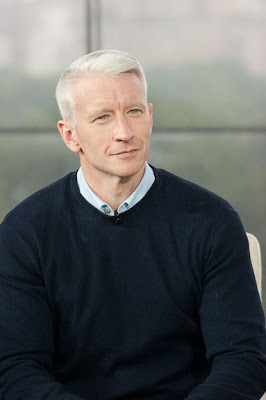 Anderson Cooper was live in Jacksonville, Florida for a Special Edition of AC360 following the Florida Republican Presidential Debate, anchored by Wolf Blitzer. For additional clips and information on today's show, please visit andersoncooper.com by clicking on the hot link below. With the holidays over and winter in full swing, several syndicated series hit season highs in the week ending Jan. 15. CBS Television Distribution's Dr. Phil took the talk crown back from Dr. Oz, adding 10% to hit a 3.2 live plus same day average household rating, according to Nielsen Media Research. Sony's Dr. Oz was steady in second place at a 3.0, but was the top talker among the key women 25-54 demographic at a 1.8, a series high for Oz in the demo. Disney-ABC's Live! with Kelly also was flat at a 2.7 and Warner Bros.' Ellen at a 2.4. Ellen tied NBCUniversal's Maury, which softened 4% to a 2.4, although it remained the top talker among women and adults 18-34 and 18-49 for the 33rd week in a row. CTD's Rachael Ray held steady at its season high 1.8. CTD's The Doctors improved 7% to a 1.6, and jumped 50% among women 18-34. NBCUniversal's Jerry Springer slipped 6% to a 1.5. Debmar-Mercury's Wendy Williams, back in original episodes, rose 27% to hit a new season high 1.4. Wendy was particularly strong in demos, tying for fourth among women 18-49 with Live! and Ellen at a 1.1, a 57% week to week increase. Wendy came in sixth among women 25-54, also at a 1.1, a 38% increase, and the show came in second among women 18-34 at a 1.0, a 67% increase for the week. Warner Bros.' Anderson had the biggest gain of any rookie first-run show, shooting 25% from the prior week to a new series high 1.5, and for the first time tied 20-year veteran Jerry Springer. In addition, Anderson grew 29% among women 25-54 to a 0.9. Blogger's Note - While it sounds good to say 'Anderson' saw a 25% gain, when working with small numbers, percentages can be mis-leading. Last week 'Anderson' matched it's lowest 1.2 mark of the season and this week matched it's highest 1.5 mark of the season. It's the first time 'Anderson' has been compared with the Jerry Springer show! It seems that 'Anderson' has yet to break through and steadily gain an audience. Dr. Phil edged Dr. Oz for top talk show honors though Dr. Oz had its best week ever with women 25-54 (and was the top talk show in that demographic). Talk shows will be all the talk this fall, with four new entries—Katie, Steve Harvey, Ricki Lake and Jeff Probst—prepping to join established shows Dr. Phil, Dr. Oz, Rachael Ray, The View and Live! With Kelly and He Who Shall Be Named, as well as talkers still struggling to secure a foothold: The Talk,The Chew, The Revolution, Anderson Cooper, Jeremy Kyleand Wendy Williams. Anderson: Should You Call the Cops on Your Kids? 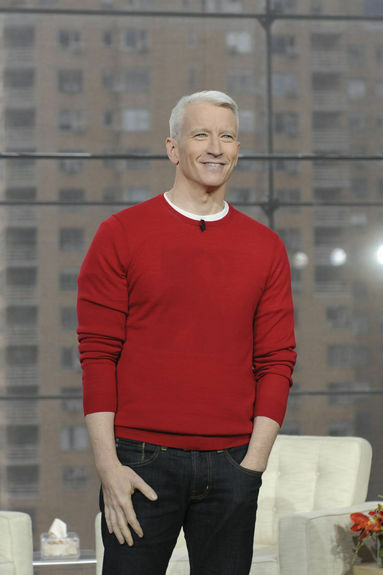 Anderson Cooper anchored a post SOTU edition of AC360 on Tuesday evening. His panel included Candy Crowley, Ari Fleischer, David Gergen, Gloria Borger, John King, Roland Martin and Paul Begala. Anderson interviewed Senator Jim DeMint (SC R) and David Plouffe (Obama Senior Advisor). John King was at on The Hill working his traveling version of the magic map. Dana Bash was also on Capital Hill and interviewed Jeff Flake (AZ R). Sharon Epperson offered advice for women on ways to protect their money to end the show. *TLC's Dr. Mike Dow, Psychotherapist joined in the discussion and shared "3 Signs Of An Obsession"
*Several audience members asked questions and shared in the discussion. 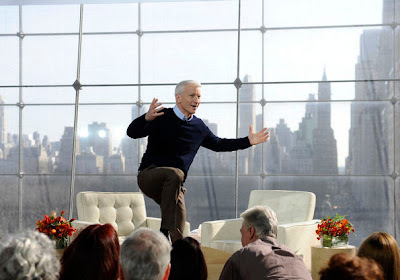 This week journalist and co-host Erica Hill, reality TV star Tabatha Coffey, viral video creator Franchesca Ramsey and an audience member from seat 123, Chanel, joined Anderson in the studio to talk headlines. An iPhone app causing controversy, a new game minimizing cell phone distractions during dinnertime, monitoring obesity in children and more -- take a look at what you didn't see on TV this week. What Story Is on Your Must-Do List? Bridget, a community member from Yahoo Shine, asks Anderson, "What is it that you love about being a journalist? What is one story that you haven't reported or interviewed that is on your must-do list?"